You're probably aware that this website has a Tutorials & Resources section where I post videos myself or other people have recorded. I've just updated that section with a short and quite informal tutorial about RAWGraphs, a great and tool by the Density Design lab. These are materials I use in my classes at the journalism and interactive media Masters programs at the University of Miami. I'm a fan of “flipped classrooms,” so I don't devote precious class time to basic software training, just to answer questions about the tools, or to explain advanced techniques if students need them. Tutorials take care of software basics, so we can use class time for lectures, discussions, critiques, and feedback on exercises. 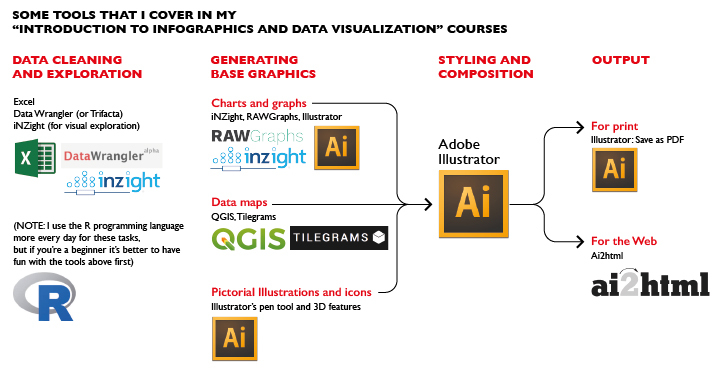 Before you ask: Yes, Tableau and PowerBI are part of my classes, but later in the semester.